Lokalise offers several translation providers, that can help translating your app or website to the most popular languages. Lokalise offers several translation providers, that can help translating your app or website to the most popular languages. Simply upload your source files into the project and use Orders menu to get an instant quote. Pay for the words translated starting from €0.07/word. Click Orders menu to get an instant translation quote for any of your projects. Choose one of the translation providers – Lokalise, Gengo, Google or DeepL. Lokalise translation team is an expert in mobile app, software, e-learning, website, multimedia and game localization. Translations in over 90 languages are available. We combine advanced technology with a network of verified in-country expert translators and localization engineers. Note: Minimum order price is $ 10, so the amount of words are not considered. You can choose a project for translation from the drop-down menu. Gengo also offers you the possibility to upload Acrobat (.pdf), Excel (.xls, xlsx), Open Office (.odt), PowerPoint (.ppt, .pptx), Plain text (.txt), Word (.doc, .docx), Rich Text Format (.rtf). Add target languages the project has to be translated to. Hit Add all languages to add all the existing languages of the project. You may also add a new language by clicking on the language field. Choose what has to be included in the order from the drop-down menu. The filtering options are Untranslated strings, Hidden from contributors, Only reviewed strings or Unverified strings. Only the keys with the specified tags will be included in the order. Lokalise partners with professional translators around the world, however, we are closely working with 10-15 preferred translators per language pair. The most affordable provider is Gengo. It is more suitable for generic translations, like e-mails, blogs, articles etc. If you want the translators to dig deeper (e.g. download your app/visit a website, read through it and etc.) use the Lokalise translation team. We offer dedicated professional translators, who are using Lokalise UI to perform the translations. Note, these translators can be reached in Lokalise Project Chat. 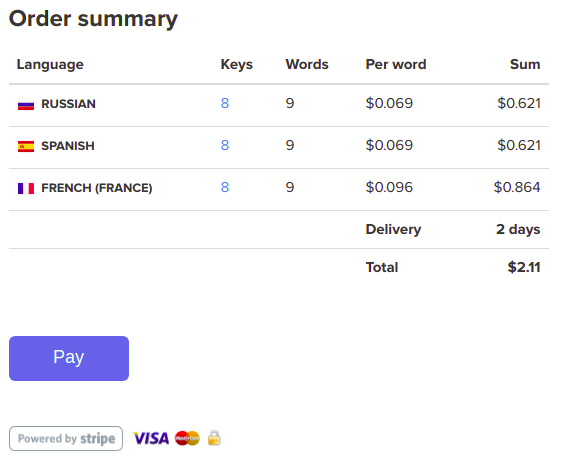 The order summary shows you how many keys and words the order contains, the price per word in each language and the total price along with the estimated delivery time. The mid-size project translations are usually delivered within 24 hours. Once the translation is done, you will receive a notification e-mail. In case a translator has a question or a comment, you will receive the e-mail as well.